Watch a young girl train with a firefighter at a fire station. How much does a firefighter's clothing and equipment weigh? Listen to a song about fire engines and watch firefighters putting out fires. Find out more about fire engines. Colour in a picture of a firefighter. Fires, accidents, earthquakes and floods - firefighters are never far from danger. 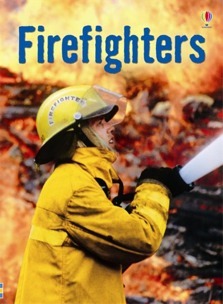 This thrilling book shows where they work, how they fight fires and how they rescue people. Illustrated with vivid, full colour photographs and illustrations on every page, and short, informative text. Includes carefully selected internet links to exciting websites to find out more. Usborne Beginners is an exciting series of books for children who are beginning to read on their own.